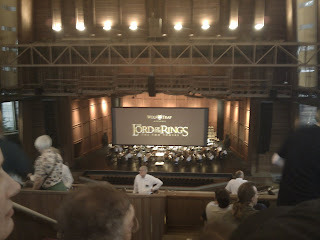 Last night I made a visit to Wolf Trap to watch The Lord of The Rings: The Two Towers. Tickets were $45 a piece which may seem awfully steep for a movie that came out in 2002. The uniqueness of last night's performance lied in the fact that the musical score for the film was performed live by a full symphony orchestra and choir. A first class collection of musicians accompanied by the City Choir of Washington pumped out Howard Shore's amazing score in complete sync with the action on-screen. For those of you who don't know, the Filene Center at Wolf Trap National Park is an outdoor amphitheater known for excellent acoustics. My friend Doe and I sat back in the balcony area covered by a roof. There were cheaper tickets to be had out in the lawn but I was concerned about the impending rain which didn't actually fall as well as the decreased sound quality. Doe had been to the performance last year of The Fellowship of The Ring and suggested I attend this year. I am a huge fan of the LOTR trilogy (best film trilogy in cinematic history - sorry Star Wars) and am in the tank for Howard Shore. I was not disappointed at all and thoroughly enjoyed the world class performance of the orchestra. The choir and soloists were so good that if I were brought to the venue blindfolded I wouldn't realize the film has a live score. Watching The Two Towers again (probably for the 5th or 6th time) I am once again reminded of the wonderful work that Weta Digital did with Gollum. He is such a complex and well-defined character in the movie and remains the most accomplished digital actor ever to appear on the big screen. He and Jar Jar Binks are polar opposite examples of how digital characters should be immersed into movies. I can't wait for 2010 and The Return of The King at Wolf Trap. ROTK is my favorite movie of all time and the Academy Award winning score is even better than the first two films. I apologize for the recent lack of posts. Work has been very consuming over the last week and I hope to try to return to a more normal posting schedule soon.